What are the Most Cited OSHA Violations of 2018? Workplaces and construction sites are responsible both to their employees and to local, state, and federal authorities for keeping their employees safe from serious injury. When workers fall victim to an accident that could have been prevented through appropriate use of safety equipment, the employers can receive violations and penalties for failing to follow important safety regulations that could have prevented the harm. 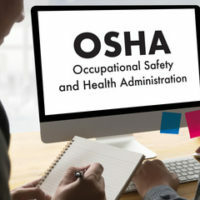 Additionally, if a facility has been reported as dangerous, the Occupational Safety and Health Administration (OSHA) may send inspectors to the site before tragedy occurs. OSHA recently released a list of the top ten most issued violations for Fiscal Year 2018. Learn more about the most cited OSHA violations of 2018 below, and contact a skilled and knowledgeable Twin Falls construction injury lawyer if you’ve been hurt on the job. The first three from OSHA’s top-ten list of violations is unchanged from the previous four years and includes some of the deadliest hazards to worker safety. Topping the list of violations is fall protection, which includes any violations issued for failure to provide appropriate safety equipment or manpower to ensure workers are not injured in a fall. OSHA issued 7,270 separate citations for fall protection violations. Falls are the single greatest cause of death on construction sites. One contractor recently received a $134,510 fine after one of its roofing workers died in a fall, having been issued no fall protection equipment. Hazard communication was OSHA’s second-most issued citation. These rules mandate that employers properly label any dangerous substances at a job site or workplace and ensure that workers understand the risks by providing necessary training to workers on how to safely use the substances. Workers can suffer fatal injuries, such as burns, asphyxiation, or explosion injuries when dangerous chemicals have not been appropriately labeled or workers do not understand their dangers. OSHA issued 4,552 hazard communication violations. With 3,336 violations issued, scaffolding is the third-most cited standard by OSHA inspectors. Scaffolding involves a risk of fall injuries which can occur as the result of using damaged or poorly-maintained scaffolding materials, or failing to train workers on proper use of scaffolding. One roofing contractor recently received a $120,320 fine for failing to train its workers on scaffolding use, failing to issue fall protection to workers who used scaffolding, and failing to provide a ladder that workers could use to exit scaffolding. If you’ve been hurt on the job in an Idaho construction accident, find out if you’re owed money for your injuries by contacting the Twin Falls workplace injury lawyers at Pedersen & Whitehead for a free consultation at 208-734-2552, or in Boise at 208-336-2552.